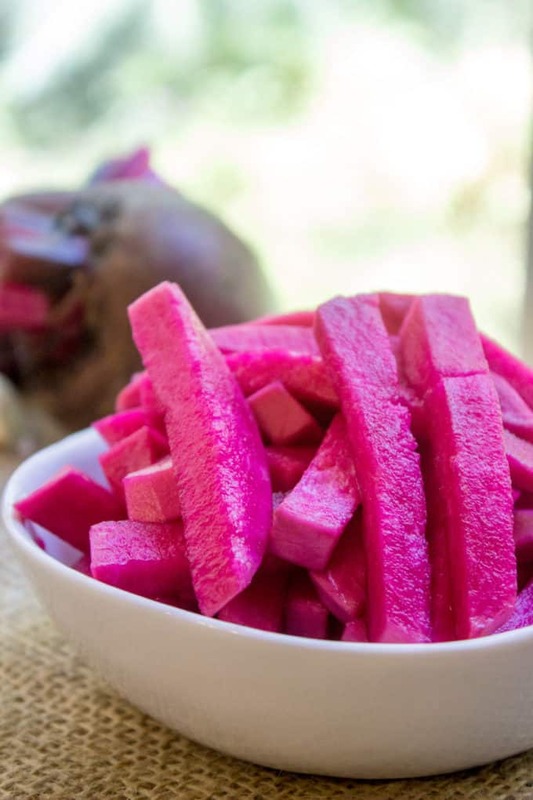 Pickled Turnips are the pickle of the Middle East, vinegary, a bit of heat and completely addicting and they are the perfect complement to your favorite gyro, falafel, roast chicken or kebab. Pickled Turnips are the most beautiful, overlooked, delicious pickle you’ll ever encounter. 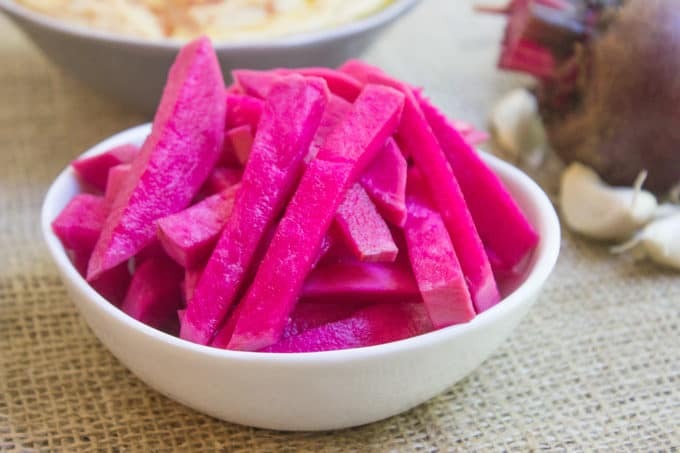 You probably have never heard of them unless you’ve had Middle Eastern food and at first glance you might be wondering why on earth they are SO pink. Rest assured, no food coloring was used in the production of these pickles. 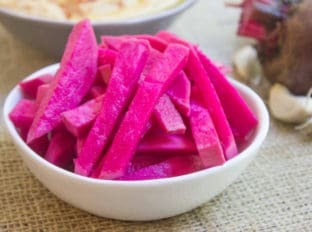 Pickled Turnips get their gorgeous hue from hanging out with a handful of sliced beets for a week. 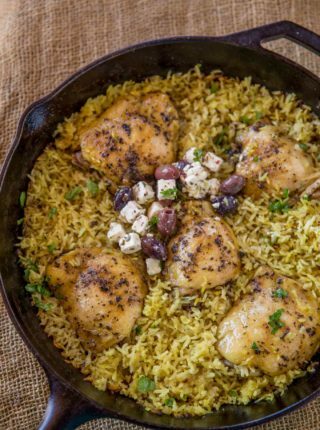 They’re incredibly easy to make and they add the perfect vinegary, slightly spicy (from the garlic) bite for your favorite Middle Eastern meals. And, if I can just add, the perfect accompaniment to these delicious Pickled Turnips? Some small hot chili peppers and the most awesome Armenian Zankou’s Garlic Paste with pita bread. 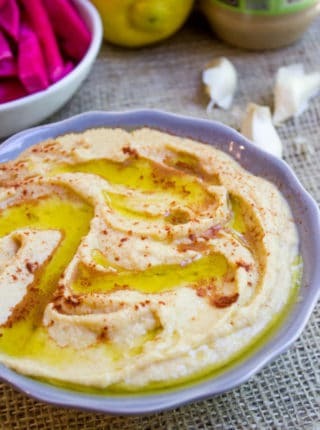 A tip on the pita bread? If you can and you have one available, go to your nearest Middle Eastern grocery store to get authentic pita bread. I promise it is 100% different than the ones put out by sliced bread makers. My favorite brand is Toufayan, they’re old school awesome and Armenian. 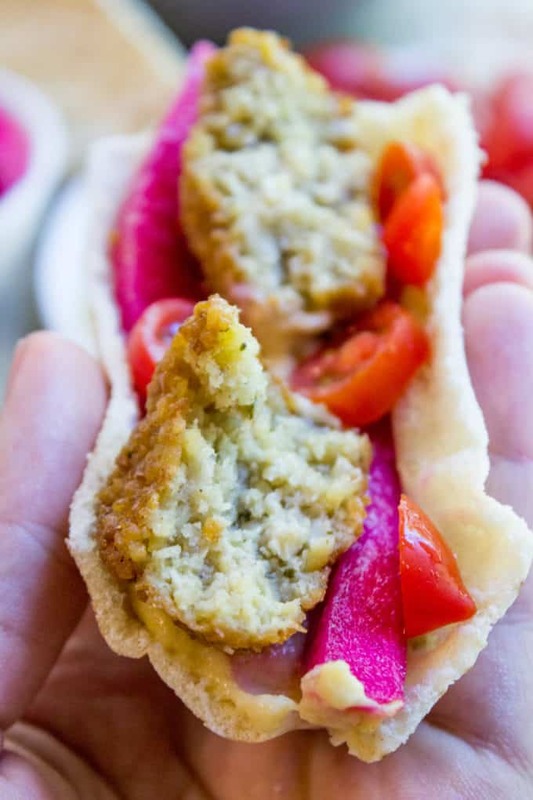 Oh, hey there Mr. Falafel, looks like you’re got a colorful pickled friend there! 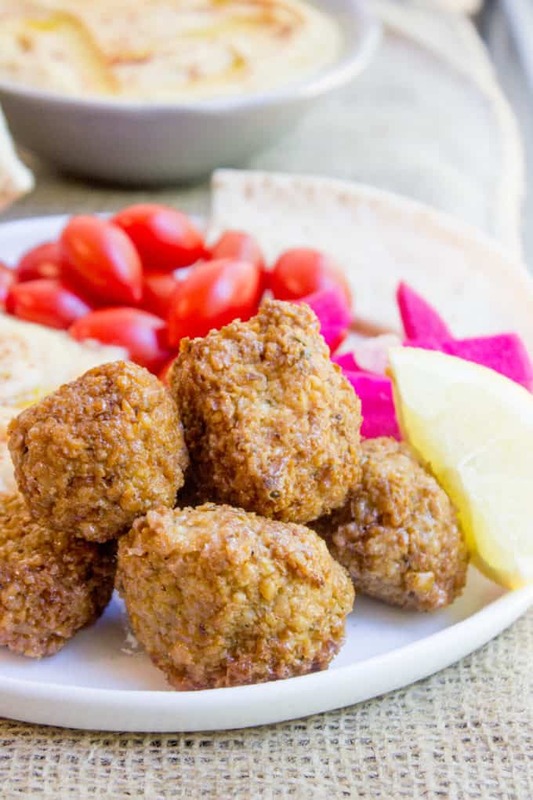 Pickled Turnips really make the PERFECT accompaniment to your Falafel sandwich. Don’t eat the garlic. Trust me, it’s been hanging in vinegar for five days and it will be STRONG. 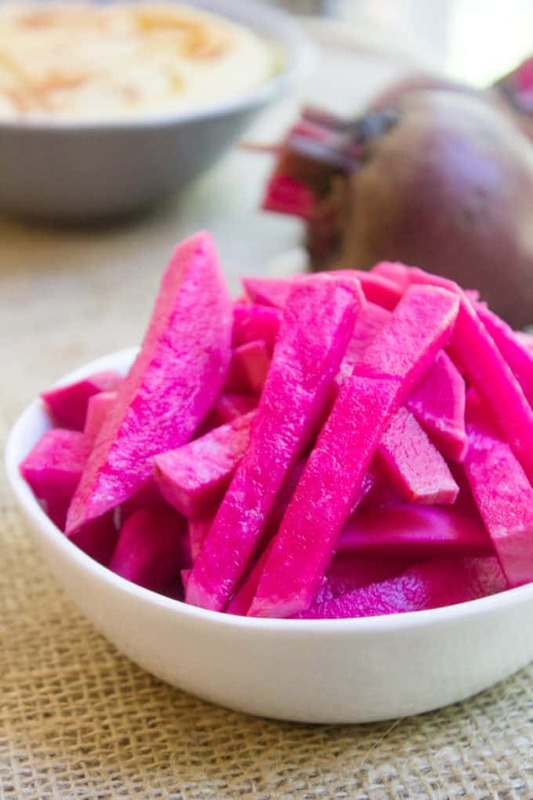 You can totally eat the pickled beets, but the texture will be different than the turnips, less crunchy, more chewy. You can let them sit for longer than five days if you want, but however long ahead you prepare them, refrigerate them before serving. They taste so much better cold! Don’t, I repeat DON’T use table salt. It will taste awful. Stick to Kosher salt. Pickled Turnips are the pickle of the Middle East, vinegary, a bit of heat. 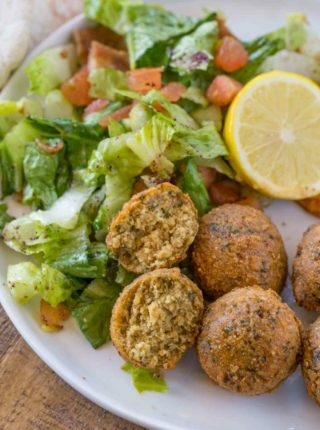 They're the perfect side to your favorite gyro, falafel, roast chicken or kebab. 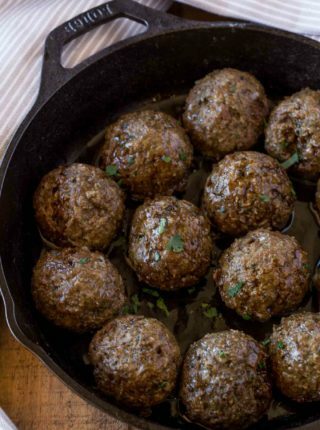 In a medium sized pot, add the water, Kosher salt and bay leaves. Heat on medium heat, stirring until salt is completely dissolved, 3-5 minutes. Let cool completely then add the vinegar. In a large container with a tight fitting lid, add your turnips and beets. Add the garlic (this can be a very rough chop, you don't eat the garlic, it is only for seasoning so it doesn't need to look pretty). Let sit for 5 days. Before serving, they are best refrigerated. The pickles are usually good for about a month (they normally last about a week in our house because I eat them with everything!). Hi Sabrina, These are delicious, thank you! Question: can I reuse the pickling liquid to make new batches of turnips? No, you’ll want to start from scratch each time. Enjoy! I followed the recipe exactly. Love that it was simple and they came out so pretty. I will definitely make again, but next time I will use a little less salt. How would himalayan pink salt work in this recipe? Other recipes have 1-2 tbsp of sugar added but this one doesn’t. It that an omission on purpose? Should there be a bit of sugar in it? I didn’t feel like it needed it. Feel free to add it if you choose. Hope you enjoy it! Next time, I will use just a TABLESPOON of salt instead.